This artist's concept illustrates a dusty planet-forming disk, similar to the one that vanished around the star called TYC 8241 2652. Stars wrapped in warm, dusty disks sound cozy, and in cosmic terms, they are. They are the incubators in which planets like our own  rocky, and fairly close to their parent sun  are most likely to form. In these disks, dust is coalescing and tiny chunks of rock are colliding to become larger masses of matter and, over the course of millions of years, planets. The theory is far from perfect, though, and computer models meant to simulate the process raise as many questions as they answer. Astronomers have lately tried to remedy that, watching dust-shrouded stars for any small changes  maybe a tiny shift in the amount of starlight making its way to Earth  that they can plug into the models to help make them fit reality. Carl Melis, a postdoctoral fellow at the University of California, San Diego, and his collaborators chose one of the dustiest stars ever seen  one that goes by the prosaic name TYC 8241 2652  and planned to watch it for a good long time. When the team took a look at it in May 2008, through one of the Gemini Observatory telescopes in Chile, the star appeared much as it had when it was first observed in 1983. In January 2009, they took another look. What they saw was astounding. A cosmic chase scene followed  reported in the current issue of Nature, as the team wangled six looks through four separate telescopes over the course of the next few years. January 2009, from NASA's WISE satellite: "The disc was just ... gone," Melis says. July 2010 from WISE: "Still gone." April 2011 from Mauna Kea in Hawaii: "The disc appeared to be gone." Then the European Space Agency's orbiting Herschel telescope: "Gone." And finally, through Gemini again in May 2012: "Really gone." 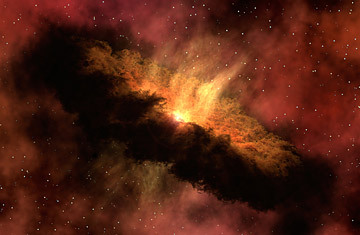 If the disk is tightly packed, the dust particles will smack into other objects on their way out, breaking off other dust particles that, in turn, are small enough to be pushed out by the star's radiation. This happens over and over and over again, ending with much of the dust in the disk dispersing into space. Such collisional avalanches can happen very quickly  consistent with the time scales observed at TYC 8241 2652. This model isn't perfect either, says Inseok Song of University of Georgia, one of Melis' coauthors. He believes there wasn't quite enough dust around the star for the clearing-out process to make total sense. Melis, Song, and their collaborators are hoping that other astronomers, will weigh in and help them solve the mystery of the disappearing dust. In the meantime, they have already begun to pick out other shrouded stars to keep an eye on, just in case their dust makes a speedy getaway, too. If they can catch those stars in the act, they will be that much closer to cracking the case. An earlier version of this story reported that the astronomers used the Gemini Telescope in Hawaii in their work. They in fact used the one in Chile.